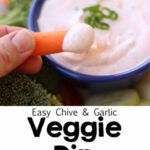 A quick and tasty dip for vegetables made using staple pantry ingredients. Combine all ingredients in a small mixing bowl. Refrigerate for at least an hour before serving to let flavors rehydrate and meld. Enjoy with your favorite veggie tray!